Allen County Fair King Stephen Parthemore and Queen Mallory Austin are overseeing this year's fair. 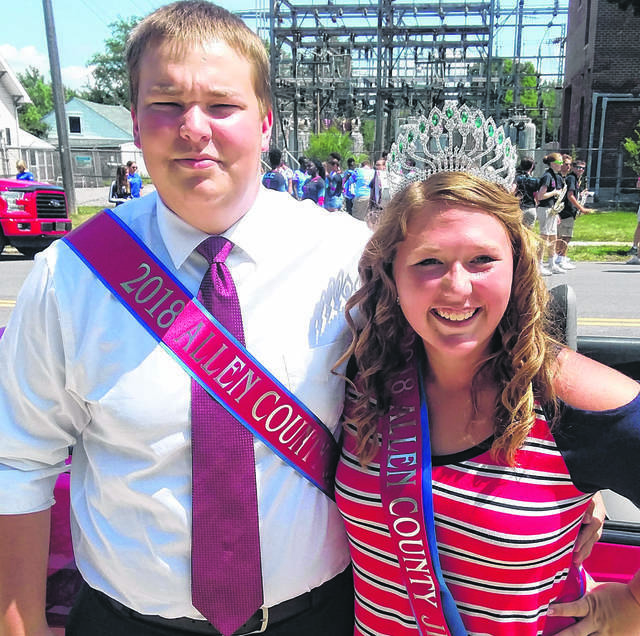 LIMA — Mallory Austin and Stephen Parthemore, both of Lima, have been named queen and king for the 2018 Allen County Fair. Austin, daughter of Jeff and Kristi Austin, is a senior at Allen East High School. She’s been a member of 4-H for 13 years and serves as secretary with the Mustang Country Connections 4-H Club and vice-president with Harrod Lively 4-H club. Parthemore, son of Jodi and Paul Parthemore, is a senior at Bath High School. He is president of the Milky Way Dairy Club and on the Junior Fair Board. He previously held the positions of secretary and vice-president in his 4-H Club. His fishing and radio controlled vehicle 4-H fair projects have sent him to the state level multiple times. https://www.limaohio.com/wp-content/uploads/sites/54/2018/08/web1_fair-parade-king-and-queen-ss-toned-3.jpgAllen County Fair King Stephen Parthemore and Queen Mallory Austin are overseeing this year's fair.